Love my trees I bought. And the shipping was fast and easy. And great customer service. Will do more ordering soon. The oval-shaped trees can grow up to 90 feet in height and 50 feet wide. The oblong leaves of the black cherry tree grow from 4-6" long. Clusters of fragrant white flowers bloom in spring. In the fall they go through a metamorphosis of yellow, brown and red. As the tree grows in hardiness zone 3a-9b, it produces large, purple wild cherries. 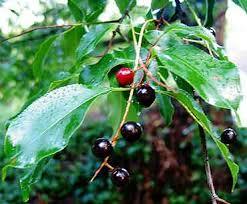 Black Cherry Tree are native to North America. Black Cherry Tree is one of nature's most valued treasures, as every year it blossoms beautiful white flowers in the spring, produces delicious plump fruit in the summer, and in the autumn months, the leaves change into shades of golden yellow and red colors so that you can enjoy the benefits all season long.It blooms into clusters of several dozen small flowers on every single stem and can spread out about "4" to "6" long in size. It's ovate-lanceolate leaves extend to "2" to "5" inches in length, with finely toothed margins. For the best results, it is highly recommended that you plant a 1-year old seedling since planting seeds directly into the soil tends to be unsuccessful. Once planted it is imperative that you do not move it as it can cause damage to the shallow taproots. Black Cherry Tree is easy to maintain as it does well in the shade or full sunlight and can thrive in a variety of soil types but prefers moist soil. Cherry trees are known to live up to 258 years and can continue producing fruit for 30 to 100 years, so you can enjoy its abundances for generations to come.The cherries start off green then become red to almost a black color once it has fully ripened.When it hits maturity within ten years, it can produce 24 to 26 inches of cherries a season, with delicious juicy fruit that is neither sweet nor sour, just perfect for making jams and jellies and even liqueurs. The fruit and seeds of the tree can attract many kinds of cute birds and mammals so you can further experience its rewards.